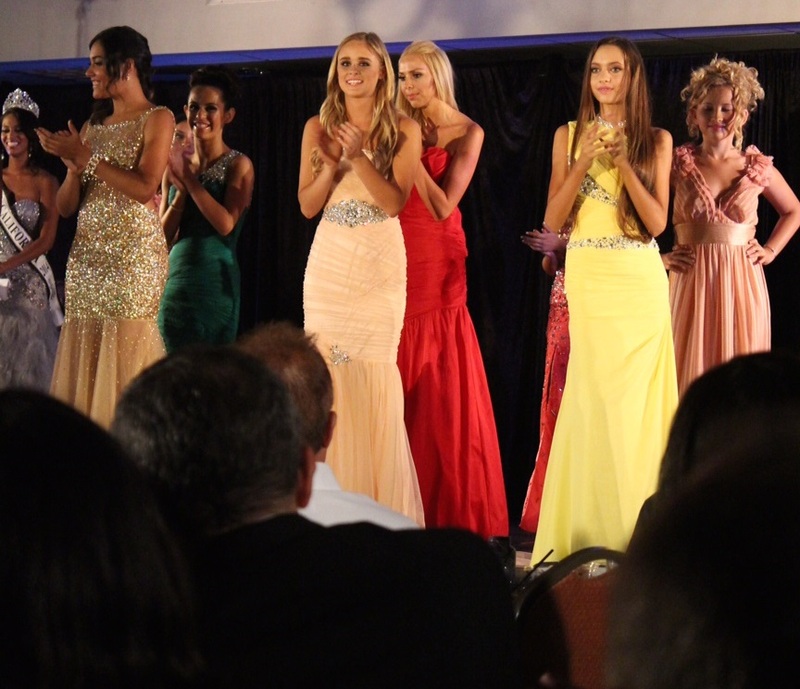 From Executive Director Amanda Lee Wasvary, Founder of Miss NoHo Productions Inc., and Co-Director Tara Rice, over 60 beautiful girls competed on Sunday night for one of titles in their category, Miss North Hollywood Teen, Miss North Hollywood and Ms. North Hollywood. Under the professional guidance of Amanda and Tara, the mission of these pageant organizers is to empower women and teens to become leaders in their community, state and nation, and to inspire others along the way. Guests were treated to a vibrant and energetic Bollywood themed opening number, with perky pink belly-dancing costumes and the latest popular Indian dance music. Poised to perfection, each of the young talented hopefuls introduced themselves to guests and confidently paraded down the catwalk in front of the celebrity judges. LA Life Magazine was honored to be in attendance and support local Hollywood model and actress, Emily Roberts. We caught up with the young teen, originally from Ohio, getting ready backstage and then later on, on the red carpet. LA Life: Hello Emily; how are you feeling? Are you nervous for your opening number? Emily: A little, but I am more excited than nervous. We have all been rehearsing like crazy and spent hours working on our performance for tonight so I am eager to show my family and supporters what I have learned when I get out there. LA Life: Which of the costume changes is your favorite for tonight? Emily: My favorite costume change was from the Sugar Kiss swimsuit to my Sugar Kiss evening gown because the evening gown portion is my favorite of the evening. I love the Hollywood glamor of long dresses. LA Life: Congratulations Emily on coming 2nd Runner Up Miss North Hollywood Teen and Miss North Hollywood Teen Evening Gown! Emily: Thank you so much – I am thrilled to have picked up two wonderful placements. I just loved the gown I wore so to win Teen Evening Gown was amazing. LA Life: Are you disappointed to not have come first tonight? Emily: Not at all. I received two awards, I couldn’t be happier. Everyone has been so lovely to me throughout this journey and I am so grateful to have been given the opportunity to compete with all the other girls. I have gained so much more than I could have hoped – I have gained friends and had so much fun. Standing on stage has also given me the self-confidence that I can use in both my acting and dancing. Emily Roberts definitely wowed her audience and the on-looking photographers with her natural beauty and enigmatic smile as she took to the stage and owned it, whether she was wearing a striking blue swimsuit or an incredible evening gown. There is no doubt that we will be seeing big things coming from this young lady, and we look forward to following her career whether it be on stage, television or film. LA Life Magazine wishes to thank the organizers, Amanda Lee Wasvary and Tara Rice of the 2014-2015 Miss North Hollywood pageant, and of course the ever endearing Emily Roberts.